Corned Beef Night & Local Spiny Lobster! Goodbye summer and hello October! To start this week we have some updates for you. Last month we launched our “Fish Taco & A Beer” Happy Hour special, thus far it’s been getting great reception! 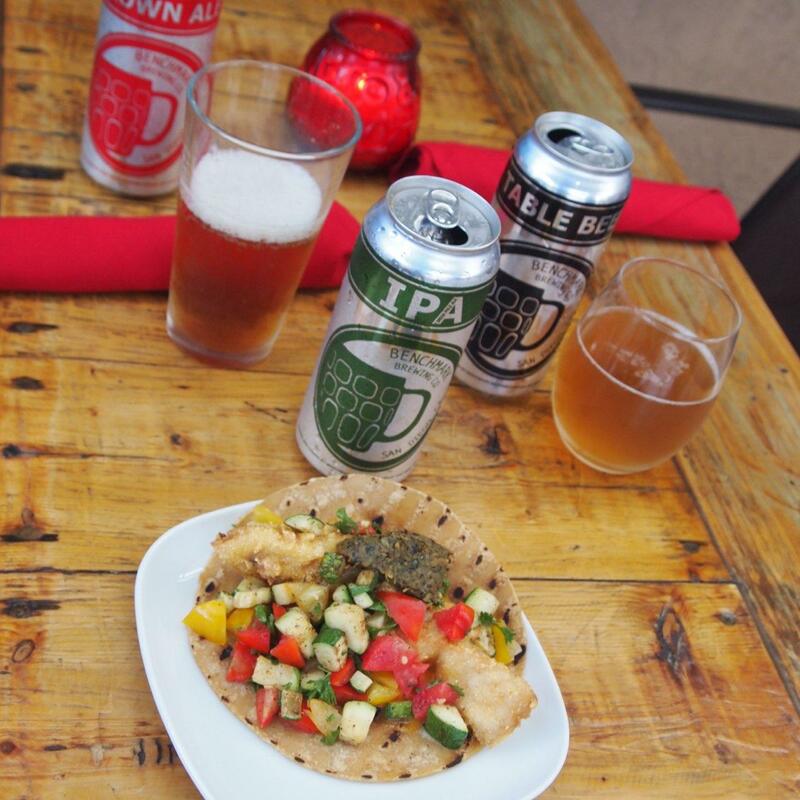 During our daily Happy Hour (Tues-Sat 3pm-5pm) we offer a fresh catch tempura fried fish taco on a corn tortilla loaded with cheese, chipotle crema & farm fresh vegetables, paired with your choice of a Benchmark Brewing IPA, Table Beer or Brown Ale for just $10! Wednesday, October 17th look forward to our 3rd annual Corned Beef Night. In addition to our 7 day brined, grass fed corned beef plate, expect to see fish & chips, lamb stew, and a surprise vegetarian entree along with Benchmark Brewing’s Blond & Voyager Belgian Dubbel on draft! Reservations for this night are highly recommended! The following week on Wednesday October 24th & Thursday October 25th we will be having our 3rd Annual Lobster Nights! San Diego Lobster season began last week, and on these two nights we will be serving fresh caught San Diego Spiny Lobster, served whole or tail only. For those who don’t know, Coral’s Dad has been a commercial lobster fisherman for over 39 years, so this is a very special treat to be able to share a wonderful delicacy caught right here in San Diego, and also a great way to support your local fishermen and fish markets. The lobsters come right out of the water, straight to Catalina Offshore, and then right to us and onto your plate. While we always source local produce from local farmers, in our world where meat and seafood gets shipped around the world, it is a rare opportunity and an honor to be able to showcase such a sustainable local seafood product and to give you truly a taste of San Diego. These are always popular nights, so again reservations are highly recommended! On Wednesday October 31 we will be celebrating Halloween at the restaurant, so bring your kiddos by for trick or treating beginning at 3 pm during happy hour and show off their costumes! For dinner we will be serving a fun & spooky Halloween themed menu. Our staff will be in costume and we encourage you to wear your costume as well! Unfortunately we are still delayed in opening our wine lounge due to the neighbor protesting our expanded ABC license, however we still remain hopeful and in anticipation have already begun expanding our wine menu. Local wines are still our focus, but we have recently introduced a “world wine” menu. Currently we have some nice wines from France, Italy, Israel, Argentina, New Zealand and of course the Napa and Sonoma regions. Next time you visit just ask for the “World Wine” menu! Most wines are available by the glass, as well as bottle- remember, you may take any remaining portion of your open wine bottle home. Many of you know our server Issac, but what you may not know is that he is a certified sommelier. He will eventually be helping us run the wine lounge and is a wealth of knowledge when it comes to wine. Recently he had the great suggestion of offering wine flights and vertical tastings, so look for these options on the menu. This is a great way to try and compare multiple wines of the same variety or the same wines of different vintages side by side. Lastly, we’ve recently partnered up with our local theatre, The Moxie, located just up the street on El Cajon Blvd. With a fantastic line up of great shows, we encourage you to buy tickets and support your local theatre. Tickets are very affordable, and its a great way to spend a couple hours! That’s all the news for now, thank you as always for your support!